As has become my tactic, I made sure to figure out a route back from a week visiting my family in Delaware that would take in a few CTMQ sites. After hitting a museum on the way down, I figured we’d make it a little more fun – and delicious – on the way back up. 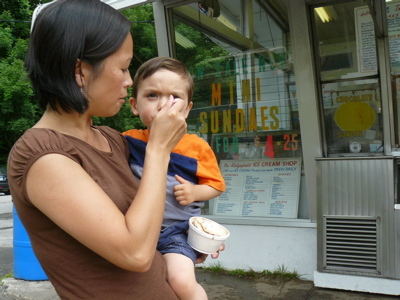 After a few hours of driving through New Jersey and across the Tappan Zee Bridge and stopping off for what could be my favorite food: fresh bread at Wilton’s Wave Hill Bread Company, we continued up Route 7 to this ice cream stand. Now it is independent, and proprietor Felix Lechner is fanatical about maintaining the highest soft-serve standards, which he believes contemporary ice cream machines cannot uphold. The machines he uses do not pump up the custard with air; instead, they deliver a dense, creamy product that is smooth as silk and packed with flavor. 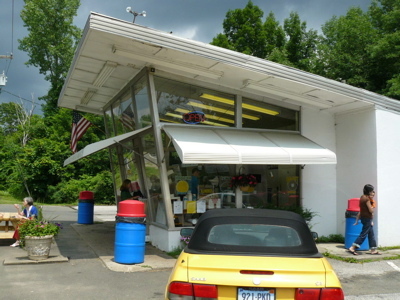 Felix told us that in order to keep his machines going, he is always on the prowl for old Carvel shops that are being dismantled and sold for parts. 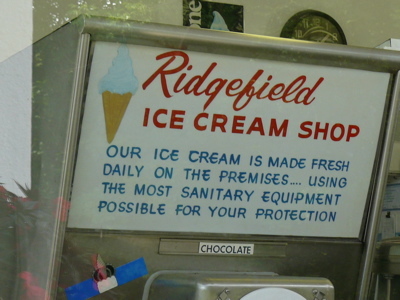 Because the kind of high-butterfat machines he uses are no longer manufactured, the old equipment is his best source of parts to keep his own running well… We highly recommend that any newcomer start with nothing but a cup or cone of plain ice cream. Chocolate or vanilla: each is a paradigm for its flavor; and after one lick, no lesser soft-serve ice cream will ever satisfy. [The ice cream here] is what Felix calls, “custard without the egg.” Opaque and full-flavored, the velvety creation is robust enough to mound up impossibly high within the store’s fine wafer cones. Even a large serving, which rises a full 6 inches above the rim of the cone, is dense enough to grasp a shell of the quick-dry dip-top, either chocolate or cherry-flavored… The chocolate is just about the most perfect chocolate ice cream on the planet: rich enough, but not the least oversweet or overflavored. So… with that in mind, guess which flavor and type I opted for? While a soft-serve chocolate cone would not normally be anywhere near my top choices, I must stick to what Roadfood tells me to stick to. 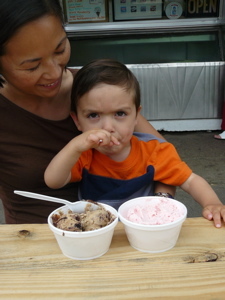 Hoang and Damian, not encumbered by such obsessive nonsense, got a bowl each of “mud” ice cream and strawberry. 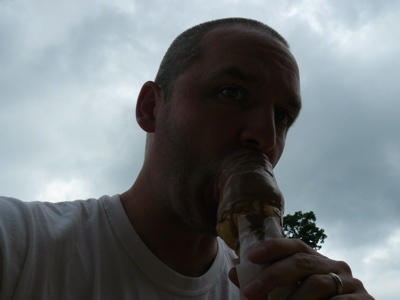 My chocolate cone was good. It wasn’t insanely good and to my mind, doesn’t hold a candle to the better hard ice creams. That said, it was probably the best soft-serve I’ve ever had; with a texture just as the professional writers described above. However, there is a fatal flaw here. 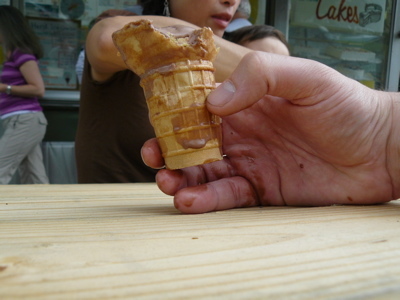 The “wafer” cone was also “wafer thin.” It held it’s shape but before too long, I had melted chocolate streaming down my hand as it was simply leaking through the cone. It was very annoying. And it wasn’t even all that hot outside. And since I’m complaining and mentioned being outside, another drawback of this joint is that the picnic tables are situated right next to the rather busy Route 7. When trucks pass, the table shakes. Damian thought it was exciting, but… he’s a little kid. Damian’s strawberry was phenomenal. Super rich and creamy, it tasted like the homemade ice cream my dad used to make back in the day with nothing more than strawberries, milk and sugar. I loved it and was left a bit confused as to why Roadfood doesn’t play up their hard ice cream a bit more. Definitely worth a visit if you’re stuck in the never-ending construction traffic on Route 7 south of Danbury. I just wanted to say I visited my friend in Connecticut and she took me to the ice cream shop and it was the best ice cream I ever ate in my life. 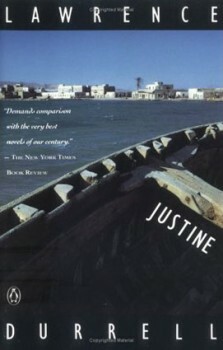 I wanted to know where could I ever find something like that in New York. I wish you had mail order or something, I would buy it if it was possible. Ruth, I would like to send you ice cream through the mail.